Squirrels look for places to nest when their current habitat has been disrupted or when the cooler weather arrives. This happens more often lately in South West Florida in part due to the ever increasing human population, and the urbanization of their native habitat. Most squirrels will adapt to locations that provide all of their wants and needs. Quite often these locations are in the exterior walls, attics, roofs, or under the foundation of our homes, which usually causes excessive damage. Critter Control® of South West Florida knows the destruction squirrels can cause and our licensed, trained, wildlife technicians can assist Southwest Florida residents with all of their squirrel control needs. 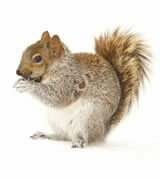 Squirrels are early risers and prefer to scurry about to gather food or just to play around. While scurrying, they may also scratch and gnaw at insulation, electrical wiring, wooden structures, and even PVC pipes. Frayed electrical wires, for example can lead to fires in homes; and gnawing on, or eliminating in insulation can cause uncomfortable surroundings, disease, and increased energy bills. If you believe that you have a squirrel infestation, Critter Control® of South West Florida recommends that you seek professional advice. Squirrels are persistent, and cause considerable damage while nesting and thereafter. They carry parasites such as ticks and fleas and may further infest your home creating additional pest problems. Critter Control licensed and trained professionals will assess your entire home, the squirrel’s current point of entry, and any other possible entry points. We will then work with the homeowner to determine the best course of action for them. Call Critter Control® of South West Florida @ (941)-313-3832 today to speak with our Wildlife engineers.